Found this single shortly after I posted the previous blog entry on Carol Rose, so it's back to Grand Junction this month. As noted in the previous story, a bio on Carol Rose mentioned that she owned the Misty record label. This record was put out the same year as her debut LP. 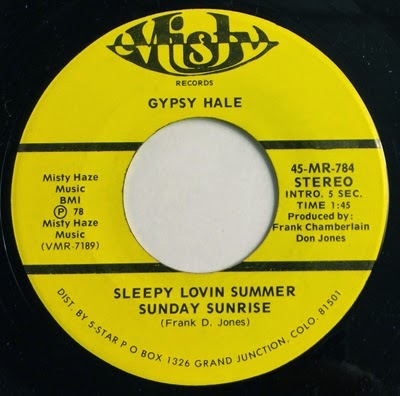 No clue who the band members are on this, if Gypsy Hale is the name of the band, the female vocalist, or if Carol Rose is, in fact, Gypsy Hale. I'm sure someone can fill me in. The only other names on here are producers Frank Chamberlain and Don Jones. Sorry for the quality of this sample. Sounds muddy to me, but I guess that's how Frank and Don mixed it. Flipside is a country instrumental, "Black Mountain Boogie."